Its April 5, and Des Moines, Iowa received a weird April mini-blizzard. Going outside was not an option, so I parked myself in the kitchen and Aunt GiGi’s Craft Corner exploded on the floor and table. 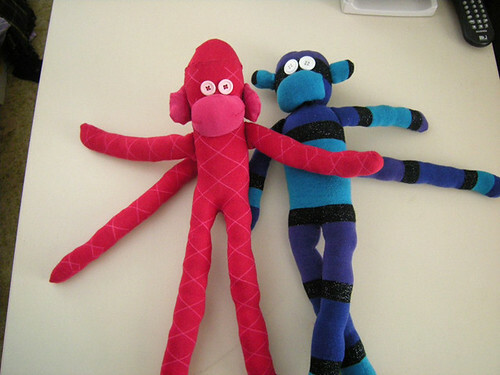 A few weeks ago I came across some Sock Monkey patterns on The Internets. I have a small sock monkey collection, various sized monkeys, keychains, and my mother even made me a pillow case with sock monkey fabric (you can find it at your local fabric store)! But why not make my own?! Since I’m not really into following patterns step by step, I did things a little different. First of all, I didn’t use socks. I used sweater tights from Target, one red with pink argyle stripys and the other purple/black sparkley/turquoise stripys. The red pair had actual feet – there was a heel section in the tights (just like socks that have a heel/toe color variation), the purple tights didn’t have a toe or heel, so thus making them reversible. It worked out very well, also allowed me to have some extra fabric when I effed up. Both of the links above have you stuffing the monkey torso and closing it off, then creating arms/tail/mouth and sewing each of those items on the outside of the body. I followed those directions on one the red monkey, but on the purple one cut tiny holes in the torso for the tail and arms before stuffing, then sewed the appendages IN to the monkey, THEN putting his torso stuffing in. I would definitely recommend that step, it makes his seams smoother. Lets backup a little bit. Sometimes I don’t plan ahead, this was one of those times. I’ve been planning on making the Monkeys for a couple of days because I had the tights, but didn’t think it all the way through. I never bought stuffing! Luckily my mother had a tote full of unfinished snowmen/Santas/turkeys from when she did craft sales 15 years ago. So I had to spend a good half hour rummaging through our basement to find the tote. Not only did I find stuffing, which is being recycled from previous projects, but I also found some old patterns. One of them was a cute square shaped top from the ’80s with from the Brooke Shield line with McCalls. Back to the Sock Monkeys. I’m very happy with how they turned out! The project was pretty easy, and perfect for a cold and snowy Sunday in April! Plus they are absolutely adorable. Hi! We're Aunt GiGi's latest creations. We need names! We won't claw your face off like real pet monkeys! Hi! I'm Ginny! I'm an artsncrafts enthusiast who loves running and eating. I also go by "Mommy" and "Most Awesomest Wifey Ever"
Enter your email address to be the first to know when Aunt GiGi's Craft Corner is updated!